Can anyone vouch for the new NON working SANDISK cards working in the BMPCC 4K please as i have the opportunity to make a swap for old cards (Friend has a BMPCC 4K with old cards). I don't want to buy new cards and then they don't work on the 4K. Sandisk as accept to send me the others cards in exchange. Found out that the Samsung EVO Plus UHS-1 256GB (advertised on the package with "Read Speed up to 100MBs/, Write Speed up to 90 MB/s), a MicroSD card with included full-size SD adapter, works flawlessly for recording up to 30fps RAW CinemaDNG on the old (1080p) Pocket Cinema Camera. Tested 20 minutes continuous recording with lots of flicker and motion - no problems/framedrops whatsoever. I've bought three 256GB SDSDXXG cards in the last three months and all have worked perfectly with my BMPCC. Sustained RAW recording with no dropped frames. I have the latest firmware but I'm starting to wonder if the issue could be camera unit specific? The only other factor I can think of is that I'm UK based and so perhaps European (country code in the serial number - G) cards are fine whereas North American cards have issues? Hello - I am in the same boat. 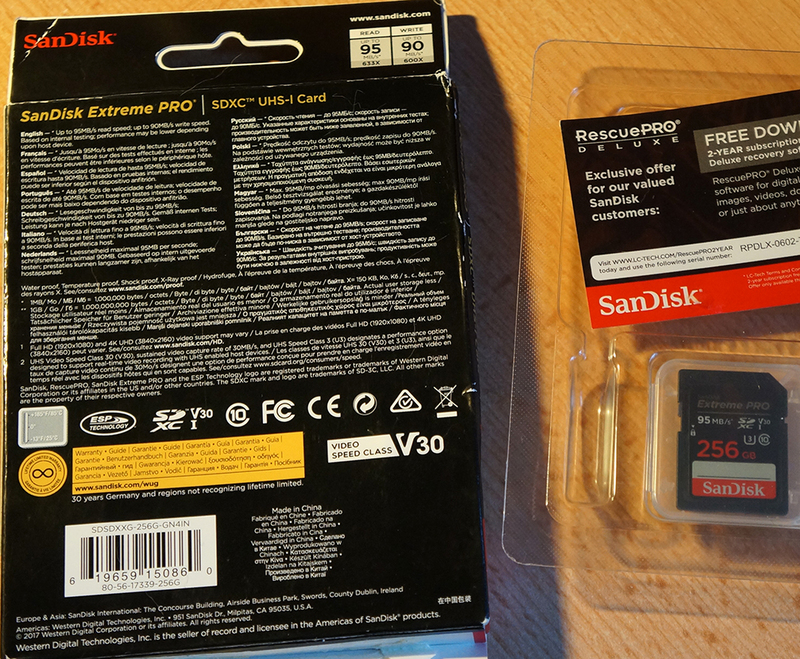 I bought the SanDisk Extreme PRO 95 MB/s 256 GB U3 UHS-1 card per the QVL on the site. I was not aware that minor revision differences of the same apparent SKU would break compatibility. I have two of these cards which I can return to Amazon but there is no way to get the "Old Version"
Will Blackmagic sell me the correct cards at a cost-competitive rate? OR do I just need to return the entire Video Assist recorder, since it's simply worthless without film? Hi Maybe i should rephrase. I just need to know if the new non working (for VA, BMPCC, BMMCC) SANDISK 95MB/s Extreme Pro cards will be recognized in the BMPCC 4K. ie not recognized in VA non 4K, BMPCC, BMMCC but recognized in BMPCC 4K. WHAAAAAT! How's that possible. That's the batch that dont work!!!! Has anyone tried a 256GB 95MB/s new card. I"ve only tried, 32, 64, 128. Could it be that perhaps the 256GB SDSDXXG cards are working? I'm just wondering, has anyone tried the lesser SanDisk Extreme Cards? The 80 or 90mbps ones. They're the yellow cards. They're listed on Blackmagic's website saying it's good enough for prores HQ recording. vanschr wrote: Could it be that perhaps the 256GB SDSDXXG cards are working? Not for me. I've got two 256G cards from that batch that I had to return. Drive Me Home wrote: Has anyone managed to find alternative cards that work? Yes, see my posting about the Samsung 256GB card further above. Thanks Johan - I saw that, but didn't look further into it as someone else replied that they had dropped frames after a few seconds with 3:1 RAW. Can you confirm that RAW/ 1080p/ 50fps works for you with these? It'd be a life saver if it did! Cheers. Just tested it on the Pocket 4K in 3:1 RAW 50p in 1080p window mode, and it works. But I don't know whether these results will be reproducible on the Micro. Johan Cramer wrote: Just tested it on the Pocket 4K in 3:1 RAW 50p in 1080p window mode, and it works. But I don't know whether these results will be reproducible on the Micro. I've bought bmpcc recently instead of my older one (that was lost along with the SD cards) and was very frustrated since i thought there's a problem with this particular cam - and I didn't experience this at all with the old cam. And then, I suspected that there's a problem with the cards, and after a few unsuccessful attempts of buying correct card I have read on BM site that theres a problem with the newer cards. I'm not sure whats the reason of such weird interaction of bmpcc and this media, I guess that Sandisk simply optimized the newer ones with cheaper controller or stuff, since new version of higher capacity of 512 gigs (most expensive one) works fine as some of the users report, and its still, non V30 version. CJ Maynard wrote: Hi, new to the forums and signed up mainly to post this info. I also just bought a Micro and a couple of Sandisk cards that are not working! I opened up a dialogue with both Sandisk and Blackmagic about it, and while Blackmagic's tech support was much nicer about it, neither company seems to want to own this problem. Just checking back in - I haven't been able to do tons of tests with it yet, but this Sony 128G card has successfully recorded RAW/24fps for about 5-6 minutes and ProRes 422/60 fps for about 5-6 minutes, with no dropped frames in my Micro. Not a comprehensive test, of course, but encouraging! Last edited by CJ Maynard on Sun Feb 17, 2019 4:08 pm, edited 1 time in total. Has anyone had success with the micro SD cards? The new ones don't carry the SDSDXX serial. For example, there is a 64GB micro sd extreme pro: SDSQXCY-064G-GN6MA. Does anyone know if these work? I have tested the 64GB micro-sd, SDSQXCY-064G-GN6MA, and it is not working. CJ Maynard wrote: Just checking back in - I haven't been able to do tons of tests with it yet, but this Sony 128G card has successfully recorded RAW/24fps for about 5-6 minutes and ProRes 422/60 fps for about 5-6 minutes, with no dropped frames in my Micro. Not a comprehensive test, of course, but encouraging! More on this - I've now probably shot an hour or two worth of material in the last 2 weeks with this card, some RAW, some ProRes 422, a handful of 60fps shots, and haven't run into a single dropped frame yet. To reiterate, I have a Micro, and the card is a "Sony 128GB High Performance Class 10 UHS-1/U3 SDHC up to 95MB/s Memory Card (SF16UZ/TQN)" found on Amazon, with Sony as the seller. I'm confident enough in it that I'm going to order another couple of them soon. Hand-held recording moving camera rapidly back and forth periodically (i.e. not a static shot). I did use the BMD Disk Speed Test to compare this card to a working Sandisk 64GB 95MB/sec card. I inserted both cards into my Kingston SD card reader which offers a USB 3.0 connection to my PC. Not sure how relevant the disk speed test is for in-camera stuff. Summary: "It works on my machine (YMMV)". Will update if there is any new information. Kudo for suggesting this one. I gave it a go on the Samsung Evo Plus 256GB and tested it on my BMPCC. Worked flawlessly for all prores options but Raw. Still handy though. And how about those Angelbird SD cards? I know they are not on the list.. There CF cards are.. But looking at the write speeds they should be more then capable.. 170MB/S and 300MB/s..
Can confirm the yellow 90mbps Sandisk Extreme 64GB cards have this same issue. Card not recognized. What did you write? I want to send an e-mail and plan to ask for a replacement. Bought two times the wrong card (first the 300mb/s then the 95mb/s), and I realized this thread after. So the problem seems the v30 cards, right? The suitable cards are over-priced in amazon although they are the older ones. After a frustrating experience with a SDSDXXG-128G-GN4IN and another one which was advertised as a SDSDXP-128G-A46 (but wasn't actually), I'm now testing a Sony Prof 64 GB SDXC Cl10 UHS-I U3. I can confirm that it is recognized at least. This seems to very much on the edge with 40 MB/s for e.g. ProRes 422 with 1080p60 which has a target bitrate of 293 Mb/s. ProRes 422 HQ at 1080p60 will most likely not be possible as it's target bitrate of 440 Mb/s exceeds 40 MB/s. As far as I researched amazon.de; I realized that sandisk is actually selling those compatible cards more expensive than the v30's. If you want a compatible 95mb/s ; 128 GB, it is 80 Euro, whereas a v30 95mb/s is 53 Euro. 64gb compatible is 44 Euro, v30 is 30 Euro. So the pocket users are expected to pay more for the older versions of the cards. The v30's are the new models right? Sandeep Gill wrote: I've bought three 256GB SDSDXXG cards in the last three months and all have worked perfectly with my BMPCC. Sustained RAW recording with no dropped frames. Hello everyone! Another new proud owner of BMPCC here. My question Sandeep - where did you buy your SDSDXXG cards (im also from Europe)? And if possible could you write down serial numbers just what to look for when searching for cards. The serial number (or more accurately the model number?) for all three is SDSDXXG-256G-GN4IN. But as you can see from this thread and others, these cards haven't worked for other people. I bought all three of the cards from eBay and all three were advertised as being SDSDXPA but when delivered were SDSDXXG. It may be worth trying as they're working perfectly for me. See attached photos for images of the actual card and box. Thanks Sandeep, you must be one lucky guy because tested out my 256gb SDSDXXG and BMPCC does not recognize it. Formatted it both on Mac and PC no change. The packaging is exactly the same as yours - the codes match (see pic below). The last digits of card serial number as somebody already mentioned in other topic are 766G (not working), that's why i was asking about your serial numbers. Must be other batch or someting. Ordered the card a week ago from ebay.de seller who had his listing for SDSDXP card and he sent the XXG version. I would never order it in the first place if i knew the listing was outdated. Asked a few other sellers with XP listings and they all have XXG versions. I'm starting to wonder if my camera is on an older firmware... Because, as you say, it seems that the cards are exactly the same. And yet in my cam they are recognised in the camera, format perfectly, write without dropping frames, and are recognised on my Mac. And if it's not the firmware, what's so special about my camera..? Is there an easy way of checking firmware version on the BMPCC? Im new with camera but so far i understand that there is no way to actually tell what firmware you are using. When you install the Camera Utilitiy it just says whether you are updated or not. I bought camera, tested card, did not work, then installed 2.1 and XXG card still does not work. If i were you i just left it as it is. I mean if it works why fix it. Ah yes, I don't intend to change anything on my camera! Guys, I also have an earlier firmware revision (I dont' remember which one but I know it's one or two versions back from before they stopped adding features for the BMPCC). Does anyone want to test rolling back firmware to find if an earlier version will allow us to use our V30 cards? Just following up with some practical experience with this card now - I've shot about 3 hours of 24fps RAW on my Micro using this card, without any issues or dropped frames at all. I've only done a few minutes of 60fps ProRes but that was also without issue. Until the Sandisk thing gets resolved, I'm sticking with these for now. We currently have 4 Video Assists and are looking into buying more, but this memory card situation is concerning. I contacted support in the U.S. last week about this issue and was told that Q/A testing is done in Melbourne, Australia and that it is likely that they are testing newer cards, but that no information has been given about when that information might be available. Now we are left wondering if perhaps we should be considering other hardware options. @CJ Maynard, thank you for the Sony card suggestion. We'll look into that one. Just wanted to report that I bought this SD card from Amazon and the BMPCC4K recognized it fine. However, when I start recording 4K/60P, it stops about 3 seconds into it. Phong, the issue with the cards is with the older Pocket Cinema Camera, NOT the new 4k one. And that you can't record 4k60p onto a card which does write ~92 MB/s shouldn't be a surprise. Appreciate the clarification. I'll just move to SSD to make this whole thing easier. Got the answer from this seller (LTLE): https://www.amazon.de/gp/product/B00NP6 ... IY4K&psc=1 saying that the XP cards is out of production so that's closed. Tested Samsung Evo plus 128Gb Read:100, Write:90 and can record from 10 to 50 secs both on Prores HQ and RAW 30fps before it starts dropping frames on BMPCC. Had a chance to try this one - Sony SF M64/T R:260, W:100, works better than Samsung Evo plus 128 Gb, even recorded more than 5 mins RAW 30fps at one point but later starts dropping frames. Also when switching between RAW and ProresHQ modes record time gets even shorter, not even up to a minute. Now waiting for that Sony 128GB SFG1UZ 95/90 card. Will comment on that after testing. RBurgett wrote: Now we are left wondering if perhaps we should be considering other hardware options. I'm also very concerned about the lack of information from Blackmagicdesign and what they are doing about the problem (if anything). A customer support rep told me to contact Sandisk and report the problem. I asked what to say to them and he said "tell them it doesn't work". When I asked him what good does that do he couldn't tell me. The card is not going to change, it's firmware can't be updated as far as I know, so the only solution that I can tell is that Blackmagicdesign should fix it in their firmware. Other camera manufacturers have done so months ago. Maybe there is a dispute between the two companies who should pay for that but we as customers are now left waiting with no information and not even a confirmation that the problem is going to be fixed or not. BTW: Sandisk is no help either as they only advise to return the cards. I'll admit, going on three months with no real word on a solution is a little surprising. I've managed to get by with a card not listed as "official", but I think, at the very minimum, Blackmagic needs to have someone actually sit down and test some of the other cards on the market, and provide new recommendations on the website. When I bought my Micro, I ordered 2 SanDisk cards immediately, explicitly because Blackmagic's documentation has them listed as officially supported. If a technological fix isn't possible, at the minimum someone needs to update the documentation, as it's causing more headaches than it's worth. I've been reading this forum for several years and learned a lot. I like BMD as a company; they make innovative products at aggressive prices and they give away a wonderful piece of software for free. But I've also learned that, regarding issues like this, we're not going to get anything more from them. Nothing. It's over until a new device comes along that works with different recording media. This is not surprising; it's just who they are. As I've said before, I would have thought they'd have given an intern a short assignment to officially qualify the Sony 95MB/sec cards that you, I, and others have had success with. It's possible those cards we think work fine don't pass their official tests. But we will never know. That ship has sailed. * When purchasing SanDisk Extreme Pro 95MB/s SD cards, please ensure that the Product Number Prefix is SDSDXP. ** SanDisk Extreme Pro 95MB/s SD cards with Product Number Prefix SDSDXXG are not supported. I'm pretty sure you can no longer buy the SDSDXP San Disk cards. I'm fortunate to have plenty of working cards for my own needs. I do feel for new owners who are really scrambling. But SD qualification has passed on to the user base. Edited one sentence for clarity. Steve, I'm with you 100%. All around, I really enjoy what Blackmagic is doing, and I've had more fun with this Micro rig in the last month than I have with any camera in years. It's easy to get caught up with frustration over some things, but I think you're very likely correct, that this problem is in the hands on the community now. And that's not that uncommon in the tech world, it's hardly unique to Blackmagic Design. Beyond sharing that one last time, I'm taking your advice Steve and moving on from this topic! CJ Maynard wrote: Steve, I'm with you 100%. All around, I really enjoy what Blackmagic is doing, and I've had more fun with this Micro rig in the last month than I have with any camera in years. It's easy to get caught up with frustration over some things, but I think you're very likely correct, that this problem is in the hands on the community now. And that's not that uncommon in the tech world, it's hardly unique to Blackmagic Design. Thanks for sharing your results. Forgive me if it sounded like I was the "post patrol"; I always try to avoid that. I was just wanting to help set expectations on what might be expected from BMD. But that's just my opinion and I could yet be proven wrong. I think the user community will benefit if you continue to have positive results with the Sony card at different settings and share that information. No worries! I never even considered that your post had that tone actually. I just thought it was a good piece of advice worth following. I've been watching this topic for a couple months now and since I don't plan on purchasing any more cards at the moment, I figured I would share what I could and then just move on with my life hahaha. I did do some test shots yesterday at 60fps ProRes422, about 4-5 minutes worth, with no frame drops. At least for the Micro, this Sony card seems like a sound solution. Sandisk Extreme 128GB (gold) with 170MB/s reading-speed written on it. to format it. Formating to expat by the mac computer doesn't help. Does anybody tried it too ?